Below we have taken two most popular platforms Laravel vs WordPress. It will be easy for you to choose from reading their own requirements & Cons! Laravel vs WordPress: Choose the Platform Precisely Enhancing your online presence can benefit you in many ways. As today world is moving towards technology and artificial intelligence, being an entrepreneur you should have your own website to leverage the maximum visibility to a Global audience. When it comes to website development, there comes one big question about which platform can be a better choice for your project. 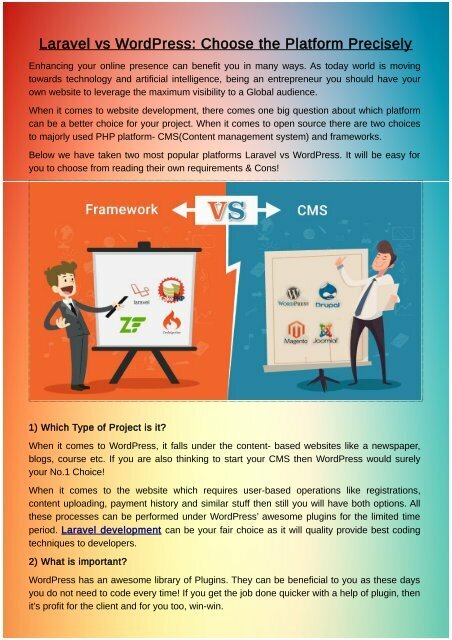 When it comes to open source there are two choices to majorly used PHP platform- CMS(Content management system) and frameworks. Below we have taken two most popular platforms Laravel vs WordPress. It will be easy for you to choose from reading their own requirements & Cons! 1) Which Type of Project is it? When it comes to WordPress, it falls under the content- based websites like a newspaper, blogs, course etc. If you are also thinking to start your CMS then WordPress would surely your No.1 Choice! When it comes to the website which requires user-based operations like registrations, content uploading, payment history and similar stuff then still you will have both options. All these processes can be performed under WordPress’ awesome plugins for the limited time period. Laravel development can be your fair choice as it will quality provide best coding techniques to developers. 2) What is important? WordPress has an awesome library of Plugins. They can be beneficial to you as these days you do not need to code every time! If you get the job done quicker with a help of plugin, then it’s profit for the client and for you too, win-win.